Automatic Batch Printing Machine For Labels, Main features of the machine are Automatic feeding, quick & easy adjustment, easy controls, accurate registering, uniform impression and high speed. Automatic Batch Printing Machine feeding by slant magazine allows labels to a polished stainless steel feed wheel, The Label is picked up by rubber and it is fed to a timing chain, which carries the label under the printing head. Automatic Batch Coding machines except TTO and TIJ do not come in contact while printing or marking on products. Beams emanate from laser marking machine while the spray of ink is sprayed from the Inkjet printer. 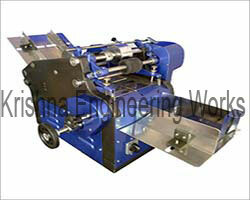 The product or machine is placed on conveyor belts which should be moving at constant speed. Automatic Batch Coder can be Use as a conveyor for Inkjet printer like automatic feeding Machine or Stacker Machine, Automatic contact coding machine is complete solution for print labels coding and marking needs in the pharmaceutical industry, Food and grocery industry, Fresh Produce, Frozen Food, bakery products, Cosmetics bottle labels, cartons and pouches. Batch coder machine for the production requirement of approximately 10000 to 25000 pieces per day to print help with special batch coding ink ( paste ink or Liquid Ink )and Ink Activator for reducer ink viscosity it stronger than permanent marker ink on most shiny surfaces, including shiny papers, most plastics. Automatic Labels, Cartons & Pouches Coding Machine installs mechanical arrangement to print at the accurate place.